With a contrasting combination of recycled brass and found cow horn, these medium-sized oval earrings lend a sleek, contemporary vibe to your ensemble. Ethically sourced materials, elegant design, and sustainable craftsmanship come together to create these sophisticated, segmented pieces. Soko redefines ethical fashion by matching marginalized Kenyan craftspeople with real-time demands to bring their stunning statements to market. Designed in San Francisco and handmade in Kenya. This design was made using a traditional sand-casting technique. With this method, a pattern or exact replica of the object that will be cast is used to create a mold. The mold is made by packing sand, which contains a molasses chemical binder, around the pattern. After the mold is created, molten metal is poured into it and allowed to cool. The mold is then removed with a hammer and the pieces are hand-finished to be smooth and shiny. 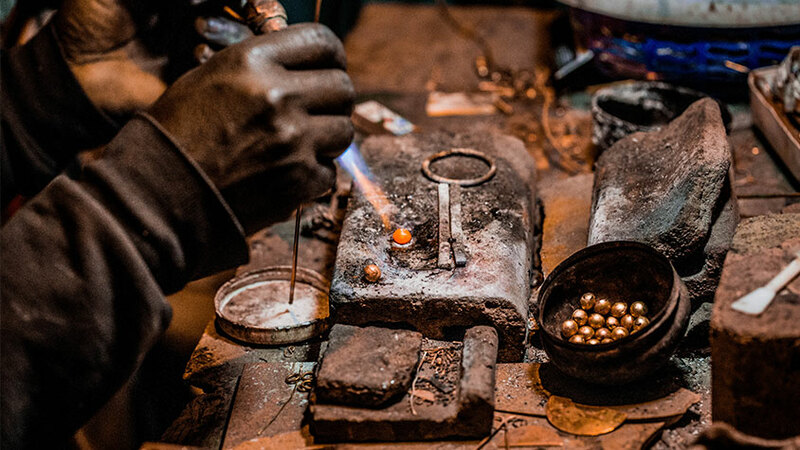 Soko, an ethical jewelry brand, was founded in Nairobi, Kenya by three women: Gwendolyn Floyd, Ella Peinovich and Catherine Mahugu. The jewelry collections are inspired by architecture and traditional tribal designs, and made with heritage techniques. The brand works with artisans in Kenya who handcraft the pieces using locally sourced and eco-friendly materials whenever possible. Soko is known for their innovative supply chain method which uses mobile phones to build relationships with independent artisan entrepreneurs. Soko’s mobile tools give the artisans access to a global network of consumers, thus expanding their business opportunities and prospects. In 2015, Soko expanded beyond Kenya’s Silicon Savannah to Silicon Valley, opening their U.S. headquarters in San Francisco.